Archaeologist Ardis Cole arrives in Egypt to help excavate a tomb recently discovered by her mentor, Jane Darvin. When Jane is murdered, Ardis must assume responsibility for the project. With the help of mysterious Blake Lydon, she must unravel the tomb’s mystery—an ancient secret concerning two miniature obelisks of gold hidden by Queen Hatshepsut’s love, Senmut, over 2000 years ago. As Ardis uncovers the ancient mystery, she finds herself drawn into a modern action tale of hatred, murder, and revenge. Hatred. Murder. Revenge. Will Ardis be able to resist their draw and solve the ancient mystery? To put us in mystery solving mode, I’ve been joined by Vickie Britton and Loretta Jackson, co-authors of ‘The Curse of Senmut’. Ladies, thanks for sparing a few minutes to delve into the mysterious depths of this tale and its intertwining Egyptian curse. For the first stop on our mystery tour, can you unravel the origins of ‘The Curse of Senmut’? We were fortunate enough to have traveled to Egypt and it was this trip and the visit to Queen Hatshepsut’s monument, Deir el Bahari that inspired our first Ardis Cole mystery. We were also inspired by tales we heard about how Queen Hatshepsut had a lover, her scribe, Senmut, and how her obelisks had once been gilded with solid gold before the conquest of Tutmose III. What happened to the gold–that was the question that inspired our book. Oooh, that is a good question to answer. I love that you have been able to take your first-hand experience of standing in Egyptian sun looking at Deir el Bahari and us it as the basis for a fictional adventure. Our love of travel takes us to many out of the way places. We personally visit all of our settings, and this experience helps us to create an authentic background and characters. How did the characters come to life once you had developed that authentic sense of place? We started with the main character, Ardis Cole, that we had created. The other characters just developed through association and from the background of the story. And as ‘The Curse of Senmut’ is the first of a seven book series, we can be assured that Ardis’s life, background associations have continued to expand over the course of the series. With seven books in this series complete, where are your writing adventures taking you next? We are currently working on a book for our High Country Mystery series, set in Wyoming. We also have plans to write a new women’s adventure about an Aztec treasure. Aztec treasure! That sounds like the beginnings of another fantastic holiday! What about writing keeps drawing you both back to translate your travel adventures into fun fictional exploits? I believe we both write because we have to. We have both always felt it was our mission in life to create characters and settings. How does that creation process unfold when there are two writers? Would I be correct to assume that there would have to be fairly detailed outlines being used so that you aren’t taking the story in two different directions? Since we write as a team, we do plot ahead of time. We have a clear outline and a good idea of what is going to happen throughout the story. However, we keep it open for change. If something’s not working, we will talk it over and change it. How do you split the writing workload? Do you do things like setup goals so that you know you’re both on target? We both write every day, but I don’t think either of us have a set goal as far as number of words is concerned. We just write until we’re finished. We’ve never had a problem with disciplining ourselves to write. Does that discipline extend to editing? We are both involved in every chapter. After we are finished, we do extensive editing to make sure the book flows. As a duo you’ve gotten enough books flowing to publish over ten books together. What have you learnt on the author waterway? Skip the advice. Write what you know and write about what you love. A book has to be written from the heart. Develop a setting and characters that you find exciting. Don’t try to follow trends. If your heart isn’t in a book the readers will know. I love that you both write with you hearts, and I feel that your hearts must be in alignment to work together. Being sisters and having similar backgrounds and experiences has helped us be able to work together without the many conflicts other co-authors encounter. In order to write together, you both have to have a firm vision of the finished book. One of you can’t be writing a science fiction and the other a mystery. The best co-authored books are ones where the authors have similar styles. I’d love to test how your similar your styles are today by tossing you both a few quirky quick fire questions to see your teamwork in action. Let’s start with why isn’t there mouse-flavoured cat food? That’s a good question. The cats would love it! Probably because nobody wants to be the taster for such a produce. Surely, the eau de mouse can be distilled down without anyone having to taste it. Here’s another curly one for you, what happens if Batman gets bitten by a vampire? He would become a vampire bat. *Laughs* I wonder if that would make him a better superhero. Are you both left or right handed? Both of us are right handed. With an outcome like that, getting scared half to death is best avoided. But something that shouldn’t be avoided is ‘The Curse of Senmut’. To prevent possible avoidance, can you leave us with a powerful wisp of words to entice readers follow Ardis Cole’s adventures? Death will devour the eternal rest of Senmut. I hope that death won’t devour Ardis as well, but that is still yet to be seen! Vickie and Loretta, thanks for introducing us to your work, and I wish you both the best of luck and fun with your upcoming literary adventures! Excited to read the book we discussed today? Find it here on Amazon: ‘The Curse of Senmut ( ASIN: B004Z1URGW )‘. 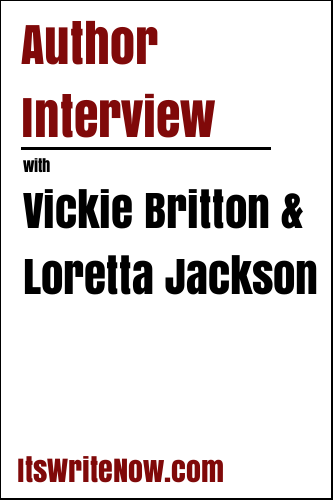 Want to find out more about Vickie Britton and Loretta Jackson? Connect here!